A DWELLER ON TWO PLANETS is one of the most important texts of the 19th century Atlantis canon. The book was “channeled” to Frederick Spenser Oliver (1866-1899) at his Northern California home near Mount Shasta over a period of three years, beginning when he was seventeen. Oliver claimed not to have written any of the text, asserting that he was merely transmitting what Phylos revealed to him. In fact, professed Oliver, the manuscript was dictated to him out of sequence (much of it backward) so that he could not interfere with the outcome. The information came from Walter Pierson, a prospector in northern California during 1863-1866 who was the reincarnated Phylos from Atlantis. As Phylos/Pierson dictated the book to Oliver, Oliver produced the text in a form of automatic writing. The book begins with Phylos’ lives in Atlantis and the wonderful technology that those people had, including electricity and airships. In part two of the book, Phylos reincarnates as Walter Pierson and is taken inside Mount Shasta by a Chinese Master named Quong. During his time inside Mount Shasta Pierson is taken in his astral body to Venus, hence the title of the book. A better title might have been “From Atlantis to Mount Shasta.” While some have called the book brilliant speculative fiction (if somewhat disjointed), believers in reincarnation cannot help but think that there is some sort of reality to this strange book that goes into great detail about antigravity, mass transit, the employment of ‘dark-side’ energy (which today would be called ‘zero point energy’), and devices such as voice-operated typewriters. The cigar-shaped, highly maneuverable Atlantean flying machines, or vailx, have an eerie resemblance to 19th and 20th century UFO reports. Phylos also speaks of personalized heavens, almost like virtual realities, something very compelling. 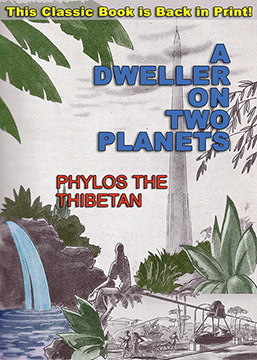 A DWELLER ON TWO PLANETS By Phylos the Thibetan, Introduction by David Hatcher Childress. 448 Pages. 5x8 Paperback. Illustrated. Footnotes.